I put away my Halloween stuff and brought out the fall stuff. I know alot of you girls already have your Autumn decorations out, but I do mine in 2 stages-Halloween and then fall/Thanksgiving. Above is a little vignette that I put on the shelf above my piano. My most favorite fall decoration is the little chipmunk salt and pepper. The grin on the little guy with all his teeth just cracks me up. Here's the other side. I found the giant flashcard with the turkey last year and decided to use a vintage turkey candle. I love the old picture next to it. That turkey is going to have the last word! Here it is all put together. The middle picture is an old puzzle of Peter Peter Pumpkin Eater. You can see I even have an old piano. This is the one I've had since I was a kid. It's pretty unique and it took me a long time to appreciate. it. I have grown to love it. I'll share more as the week goes on. Hope you all had a good Halloween. I even got Hubby to help me carve the pumpkin this year-I think he was waiting for all the kids to be gone. He did a really good job! I can see why those s&p shakers are your favorites. What a toothy grin! Your Thanksgiving decorations are really wonderful. I had to zoom in to see what that was above the piano. Yes, I'm THAT nosy! 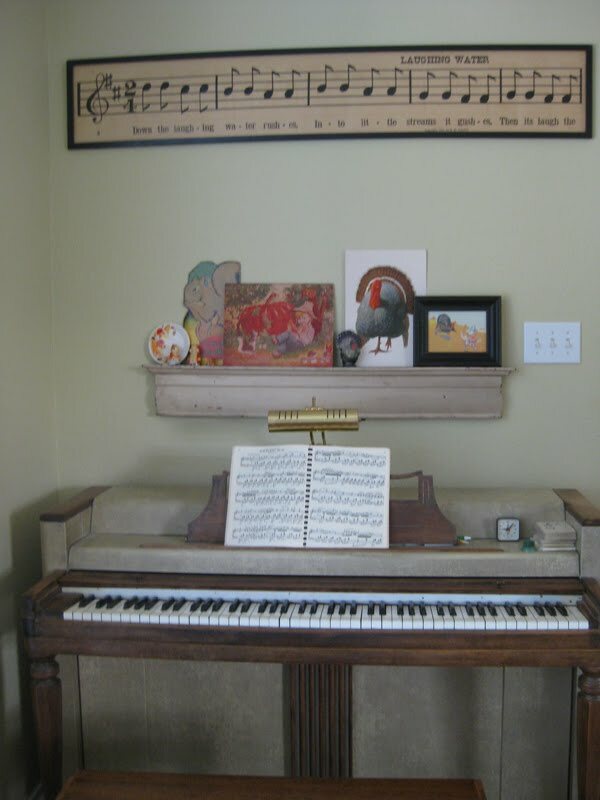 I love it, and it's a nice whimsical touch over your piano! I simply love all of your Thanksgiving items. I bought a box of large flash cards recently. I'm off to see if there is a turkey card. Thanks for sharing. Those are the cutest S&P shakers, those expressions are the best! Love all your Fall decor, such fun illustrations. How wonderful that you still have your childhood piano, what a treasure that is. I guess I do my Fall decorating in three stages :) - Halloween, Day of the Dead (today we finish our DOTD altar) and then Thanksgiving. I just realized to my horror this morning (while standing in the shower!) that with my husband's school district forced to take furlough days (due to CA's total lack of funds) - I have very little Thanksgiving crafting days (on my own, unfettered by the hubsy) to accomplish what I need to. ACK! I better crank it way up, starting NOW. P.S. Thanks so much for your sweet comments re my cards - they were great fun to make! 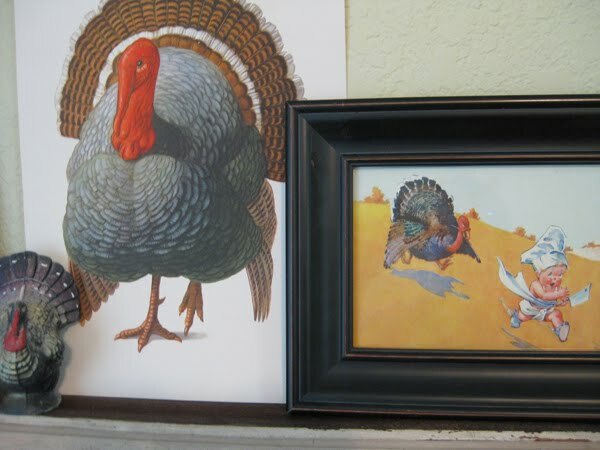 Love those vintage turkey prints!! Thanks for stopping by. I do love my old oven and don't want to replace it. It is so cute. 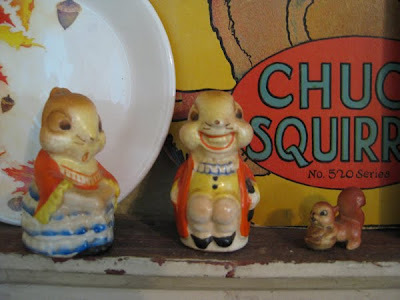 I love all your vintage decor too. Reminds me of stuff my mom had and wished she would have kept. I too do Halloween and then Thanksgiving decor. I'll have to post pics of my Pilgrim collection.